This is one of those films US distributors bought from Russia and tried to sell here in North America with deceptive titles or re-edited in different stories. The story obviously has nothing to do with Sinbad but US distributors sold the film as such. I'm currently doing a Fan Dub and a Fan Sub of this and a combo Fan Sub/Fan Dub. The original film in Russian has loads of songs in it which were cut or altered so I created a Fan Sub of the original Russian and burning English subtitles to it, including subtitles for the moments with the songs. And I'll be adding the English dub track to it as well and try to add the English subtitled song bits with the English dubbed film. Anyway, I'll tell you if I can pull it off. 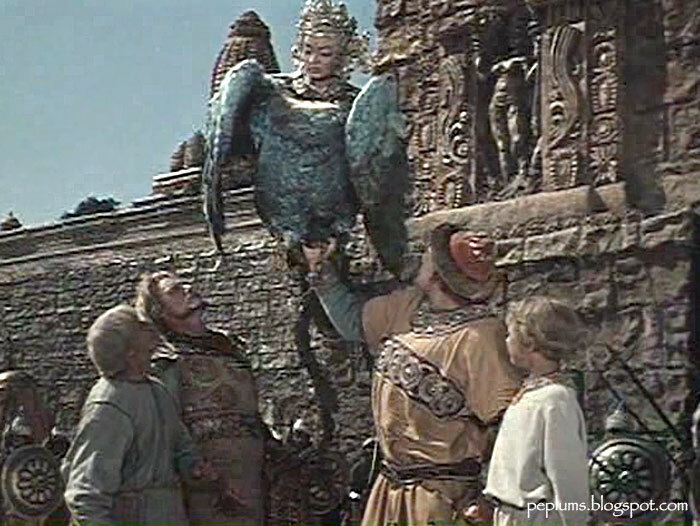 I wonder if Russians ever did Greco-Roman inspired films. I know of the Romanian films COLUMNA and DACII but actual Russian films set in Ancient Rome or Greece? Or they were a no-no because of some of the 'Biblical' aspects of such films. I would need a crash course in Russian films to know if any exist. I know MOSFILM has a Youtube channel and they've uploaded many films there but I can't go through all of them to see. I've discovered JOURNEYS BEYOND THE THREE SEAS and RUSLAN & LYUDMILA from that channel, which look interesting, and also ALADDIN AND HIS MAGIC LAMP (not Mosfilm but Gorky Film) which looks great (see here) but aside from those titles and a few famous other serious titles like IVAN THE TERRIBLE or ALEXANDER NEVSKIJ I'm sorta clueless when it comes to Russian PEPLUM cinema or historical films set in Antiquity. I can think of at least two Greco-Roman films from Russia: "Dafnis i Khloya“ from Yuri Kuzmenko and « Rus iznachalnaya » from Gennadi Vasilyev. Eastern european countries have indeed produced a few peplums. You mentioned the Romanian productions (I would add « Burbista » from Gheorghe Vitanidis to that list) but also the Bulgarian movie « Ezop » from Rangel Vulchanov and the Polish movie « Thais » from Ryszard Ber. Rus iznachalnaya sounds interesting. I love anything with Emperor Justinian and Theodora. As for the other titles, thanks. I've bookmarked their IMDB pages and will try to find a copy.